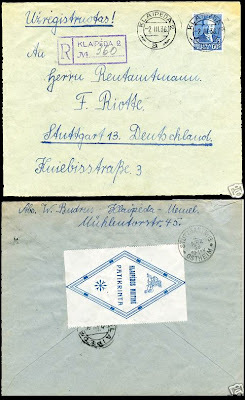 Registered censored cover from Klaipeda (Memel) to Germany dated 2 March 1936. Klaipeda-2 sub-office cancellation. Censorship label on reverse. Since being elected in Germany in 1933, the National Socialist party supported German nationalist forces in Klaipeda. In the mid-1930s, Lithuania started to censor mail to Germany in an attempt to identify German subversives operating in Klaipeda.